We recently asked you for your favorite 18th and 19th century (‘Age of Gunpowder’) battles to be included free for early backers of General Staff (see this link). We don’t want to spoil any surprises, but the Battle of Isandlwana was one of the top vote-getters. Screen shot of the General Staff Scenario Design Module showing how to edit specific unit type versus unit type combat equations. 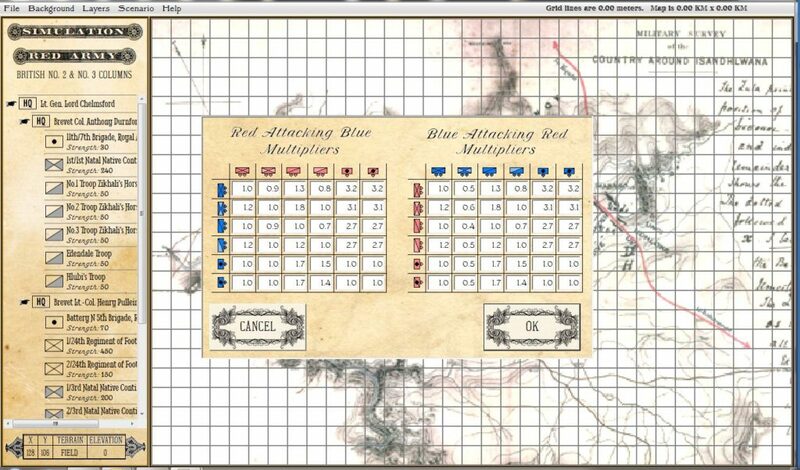 In this example Blue Light Infantry (Zulu regiments) have been adjusted downward. Click to enlarge. The Battle of Isandlwana is an especially challenging scenario to simulate because of the difference in technology (the British were armed with Martini-Henry breech-loading rifles while the Zulu warriors carried the traditional assegai iron spears and cow-hide shields). Yet, there are ‘Light Infantry’ unit types in both the Red and Blue forces, but clearly there is a very big difference between the Red (British) Light Infantry and the Blue (Zulu) Light Infantry units. 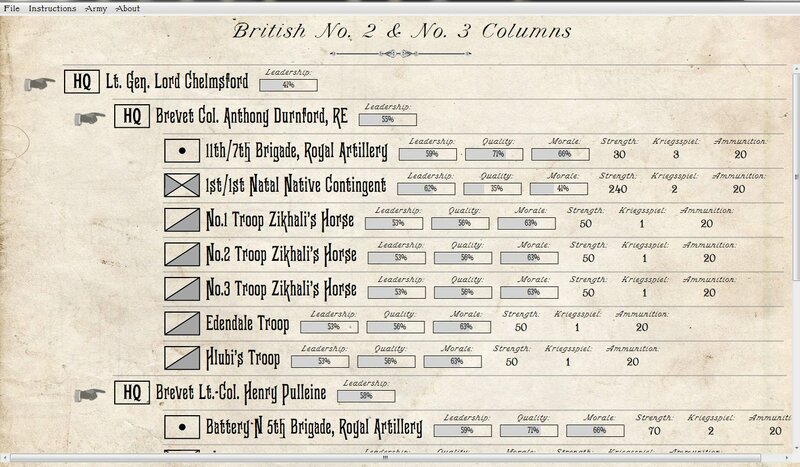 General Staff, which is based on the UMS Wargaming System, has the ability to adjust a unit’s combat firepower versus other unit types (see the above screen capture). In the above image we have set Blue’s Light Infantry (Zulu regiments) with a lower Attack Multiplier representing the Zulu troops lack of muskets and rifles. This matrix is available from the General Staff Scenario Design Module. Screen capture of the British army Order of Battle for Isandlwana . Click to enlarge. In the above screen capture from the General Staff Army Design Module we see a portion of the British Order of Battle at Isandlwana. The question is: what should Leadership, Morale and Efficiency be set for each of these units? How good were British commanders? What was the morale of native troops? How efficient were they? We would love to hear your comments. This entry was posted in Gameplay, Scenario Design Module, Scenarios, Uncategorized and tagged British Army, Combat Resolution, Light Infantry, Zulus on August 15, 2017 by EzraSidran.